In our view, MMOs are almost perfect illustrations of a new learning environment. I have minor gripes and major gripes about this book. A minor gripe is they say "petri dish" a lot, and I think they shouldn't. 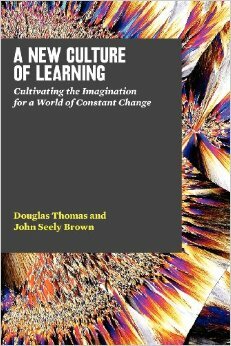 A major gripe is that the whole book is essentially a false dichotomy between a straw man version of schooling and impoverished, unworkable gesticulations labeled "new learning." It isn't that there aren't any good ideas here, but they are old ideas misunderstood and presented as if new.